The Mudumalai National Park, one of the first forest ranges to be declared as a National Park is located in the Nilgiri district in the border of Tamil Nadu and Karnataka. 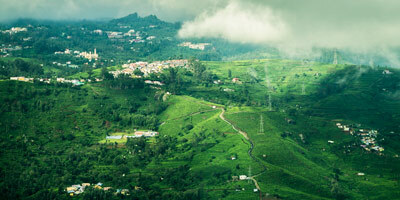 The park is located in the Ooty-Mysore route and can be entered from both Ooty and Mysore. The National park was recently declared a Tiger Reserve with a population of about 50 tigers. The National Park is one of the most critical ecologic systems in the country, with the Bandipur National Park and the Nagarhole National Park to the north and the Wayand wildlife sanctuary to the south and between them they house more than 500 species of animals, birds, reptiles and even more species of insects. Needless to say the place is breathtaking and captivating for anyone who appreciates nature. The climate of the area is tropical wet in nature. So the best time to visit would be early summer or just after the monsoons. As you ride through the forests you are bound to see elephants roaming freely in the wilderness and different types of deer for starters. As you move deeper into the jungle, if luck favors you, you will see many endangered species of birds and animals. High in the list of endangered birds are the vultures. Monkeys like the Grey Langurs are common in the forest. You find varieties of snakes like the Great Indian Rock Python, Spectacled Cobra, Pit Viper and so on. Trees like teak, sandalwood, mahogany and also bamboos grow uninhibited and tall, almost cutting the sunlight even when the sun is high in the sky. So it is advisable to reach the reserve during noon or just after noon and also carry alternate sources of light with you. Warm clothes is a must as it gets cold from the evening onwards. An umbrella or raincoat is not a bad idea, because the rainfall is quite erratic in these parts and sometimes occurs just out of the blue. In addition to animals like tigers, elephants, panthers and deer among others, you find a scores of amphibians and many exotic birds, like different types of parrots, eagles, vultures and some others which you have never seen in your life, and will never see anywhere else. It is said that 13 percent of all mammal species in India are present in Mudumalai National Park. The Indian Giant Squirrel, the Flying Lizard, Indian Leopard, which are in the endangered list are found here. The Moyar River runs through the reserve and you are assured to see a large variety of a fauna coming there to quench their thirst. The Forest Department maintains many forest houses at various locations inside the park which is provided in a first come first serve basis and they need to be booked in advance by calling the Ooty office of the National Park. The Mudumalai sanctuary connects the Eastern Ghats and the Western Ghats together. The park is one of the very few places in the country where you can see the animals in their true natural habitat, where you actually see the tiger with all its ferocity. A must place for a true nature lover.